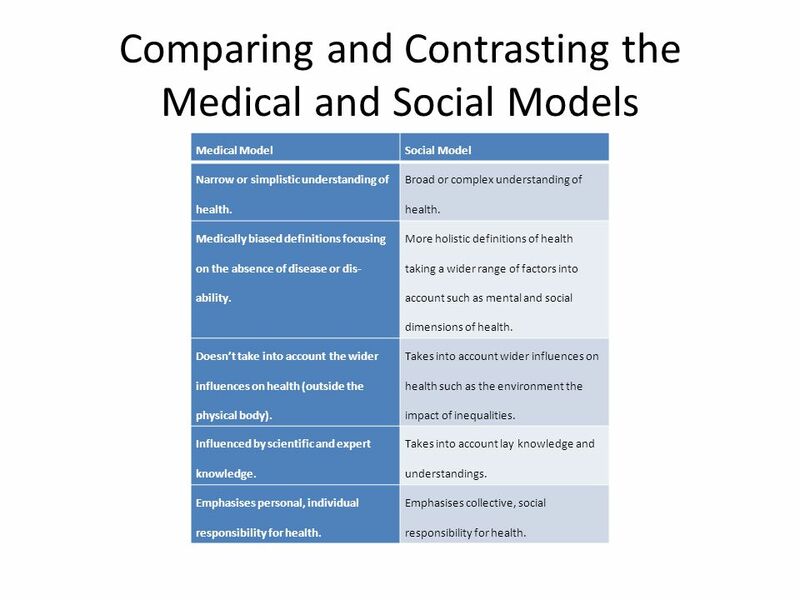 Medical Model Social Model Narrow or simplistic understanding of health. 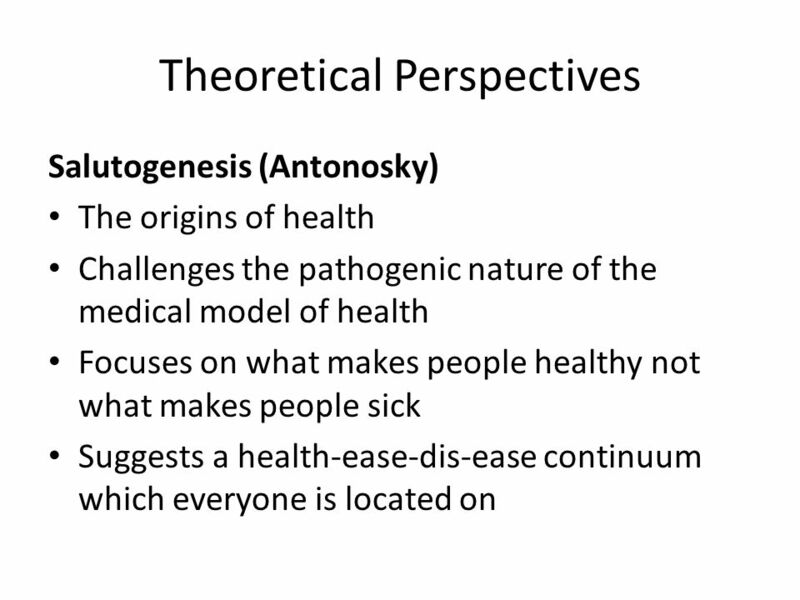 Broad or complex understanding of health. 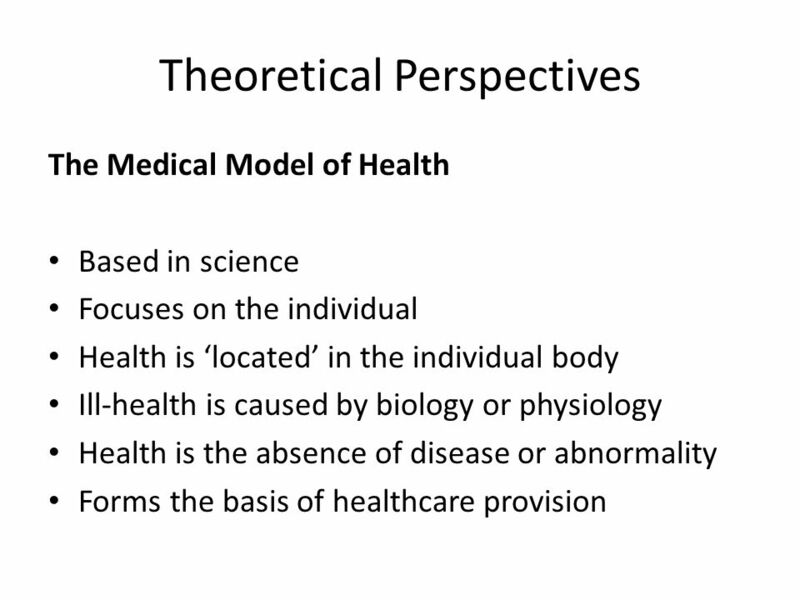 Medically biased definitions focusing on the absence of disease or dis-ability. 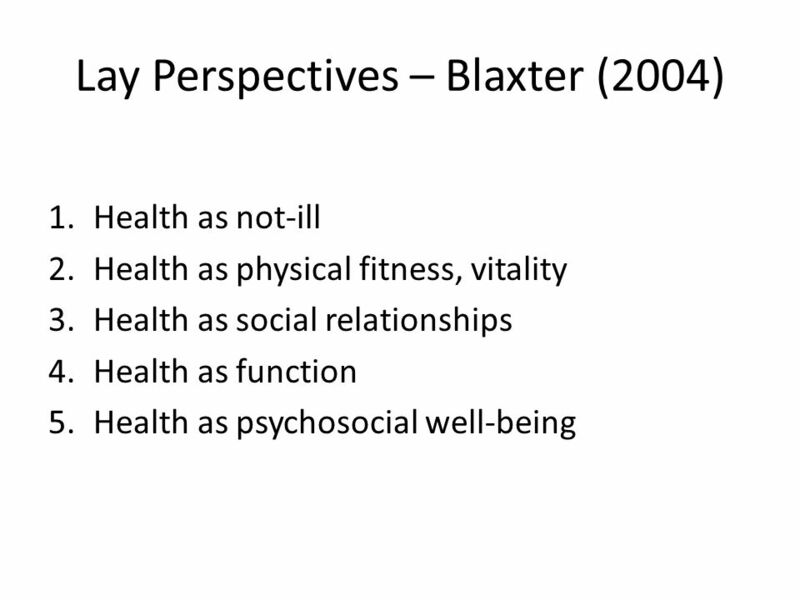 More holistic definitions of health taking a wider range of factors into account such as mental and social dimensions of health. 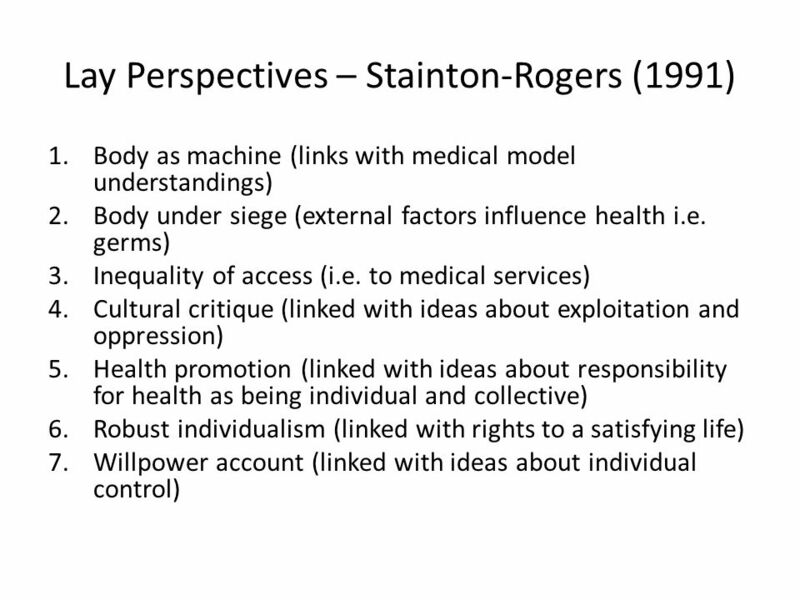 Doesn’t take into account the wider influences on health (outside the physical body). 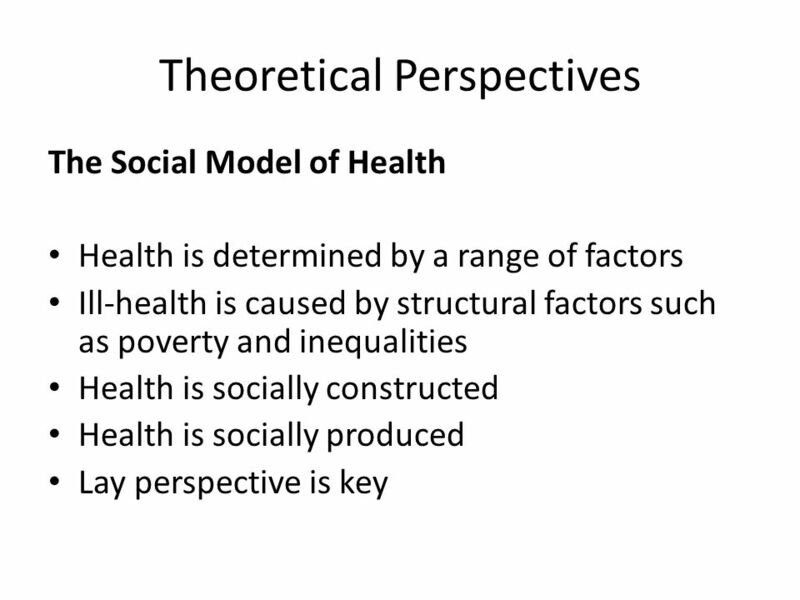 Takes into account wider influences on health such as the environment the impact of inequalities. Influenced by scientific and expert knowledge. Takes into account lay knowledge and understandings. Emphasises personal, individual responsibility for health. Emphasises collective, social responsibility for health. 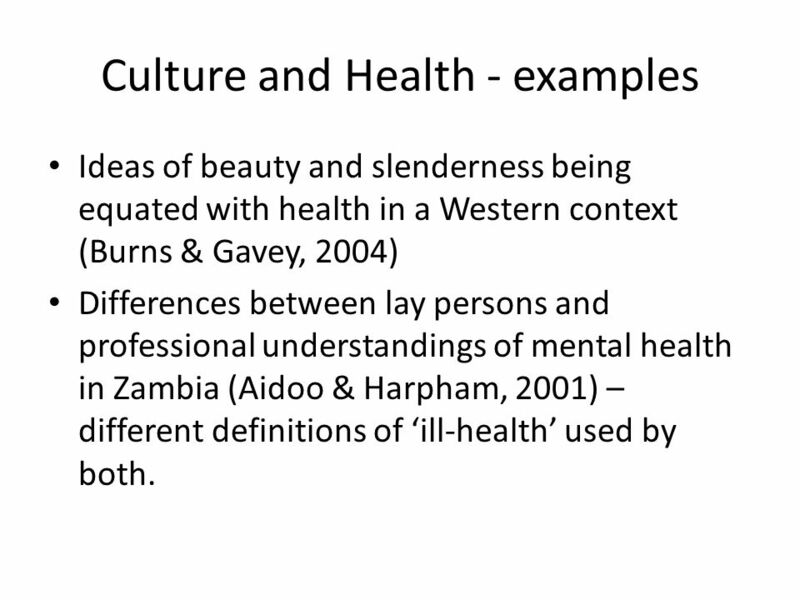 Ideas of beauty and slenderness being equated with health in a Western context (Burns & Gavey, 2004) Differences between lay persons and professional understandings of mental health in Zambia (Aidoo & Harpham, 2001) – different definitions of ‘ill-health’ used by both. 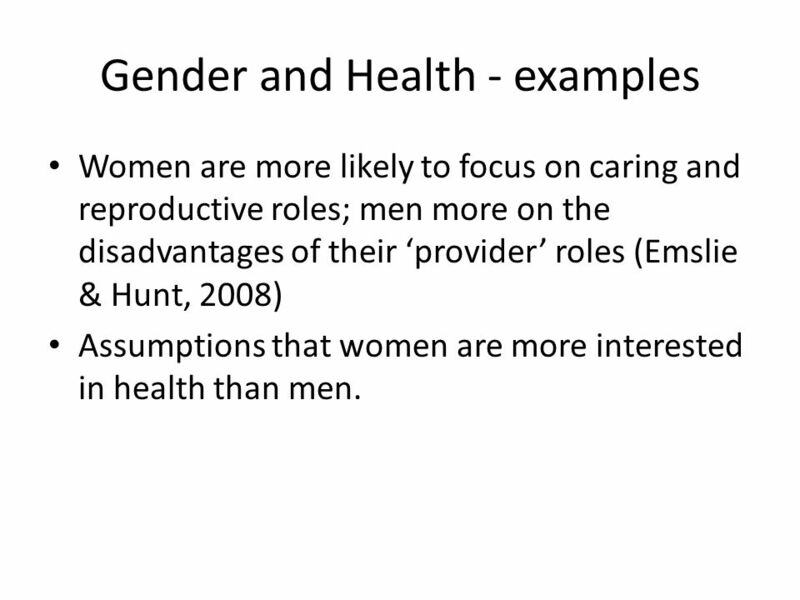 Women are more likely to focus on caring and reproductive roles; men more on the disadvantages of their ‘provider’ roles (Emslie & Hunt, 2008) Assumptions that women are more interested in health than men. 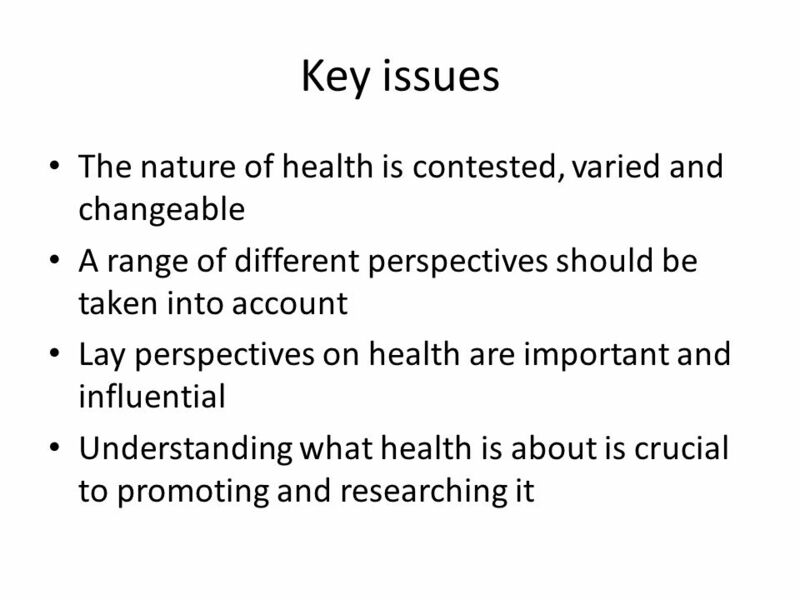 20 Summary Health is a complex concept and is difficult to define. Many different definitions and understandings exist. 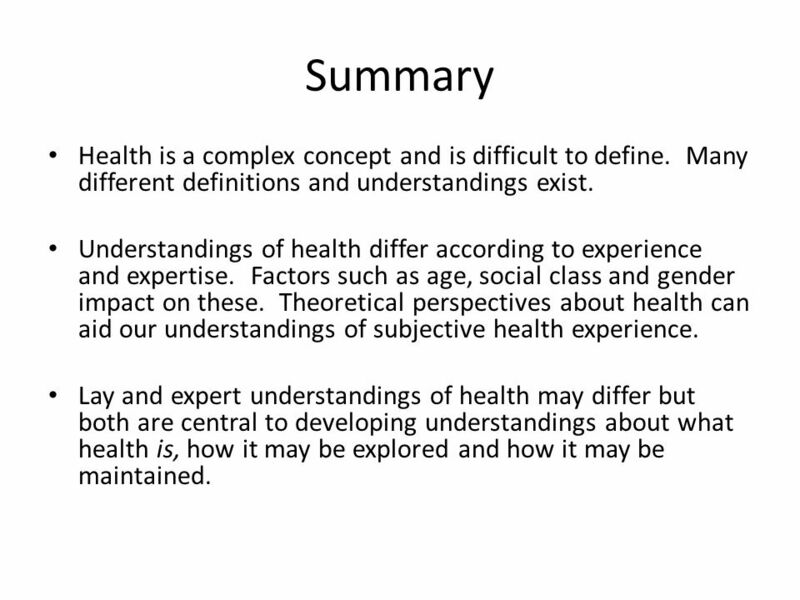 Understandings of health differ according to experience and expertise. 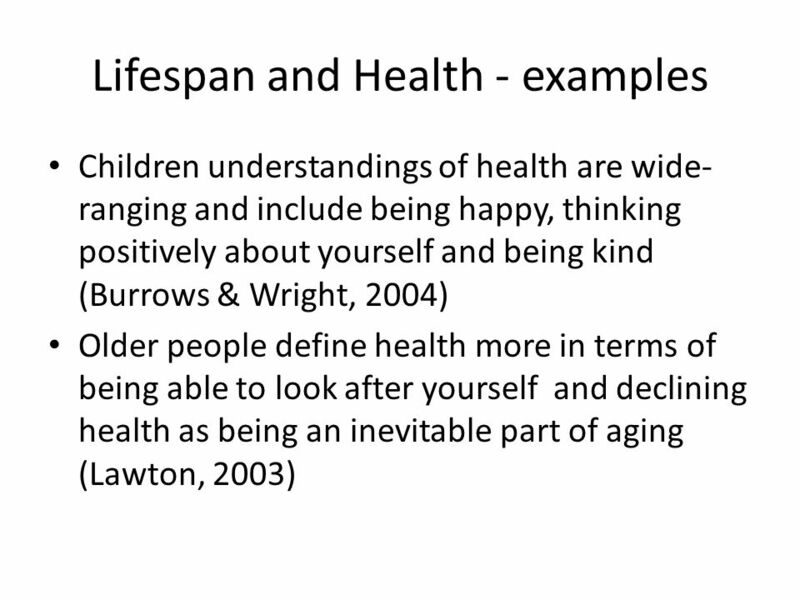 Factors such as age, social class and gender impact on these. 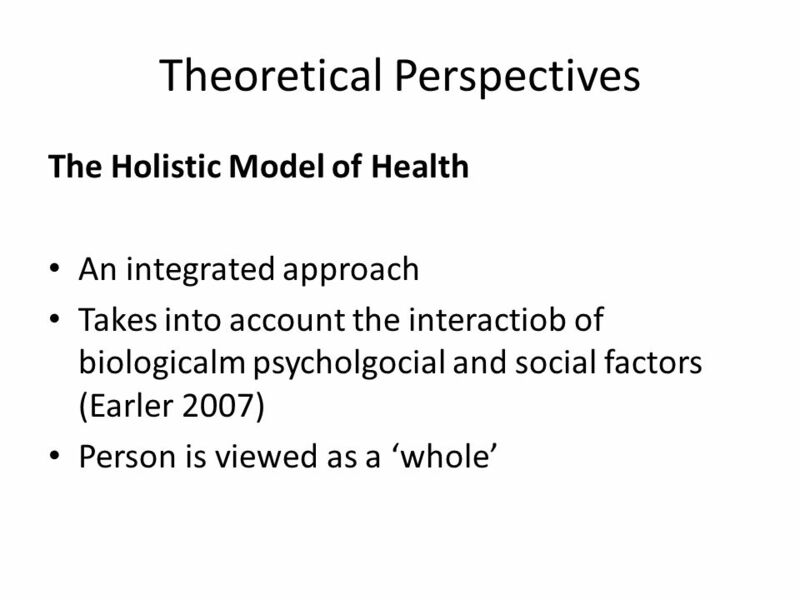 Theoretical perspectives about health can aid our understandings of subjective health experience. 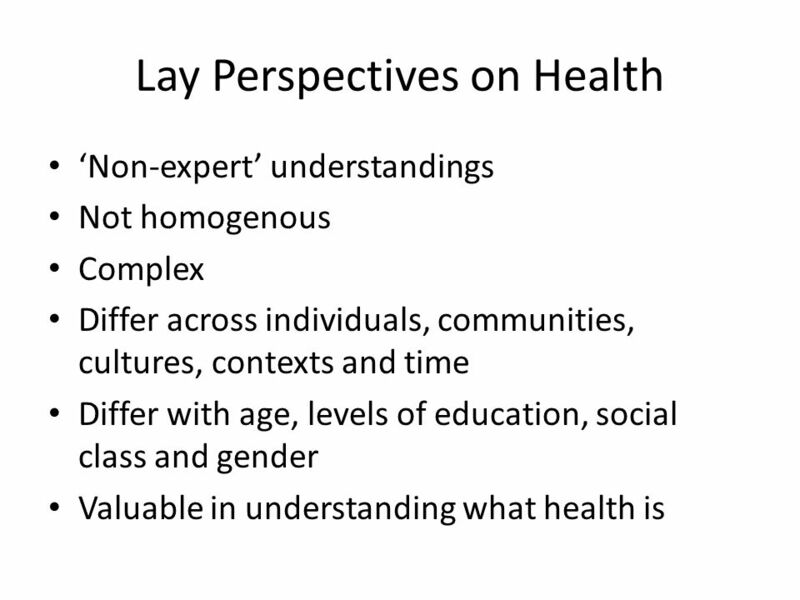 Lay and expert understandings of health may differ but both are central to developing understandings about what health is, how it may be explored and how it may be maintained. 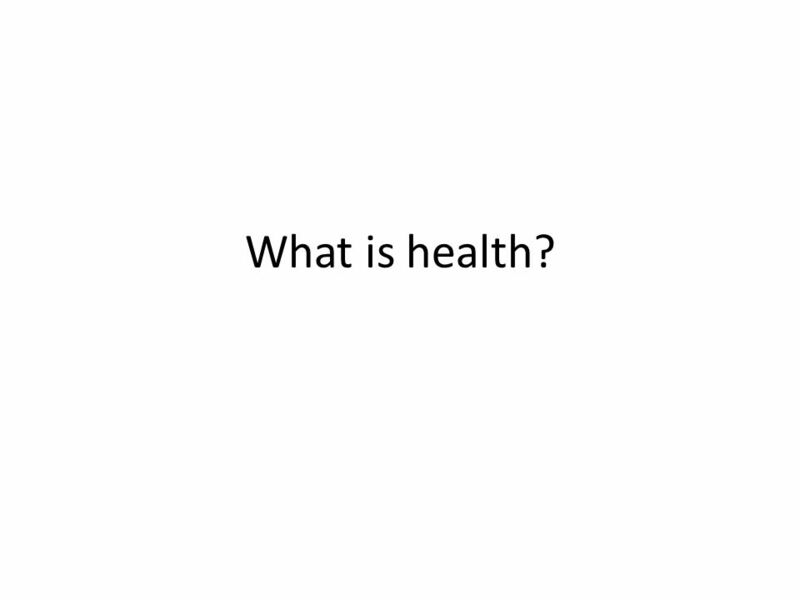 Download ppt "What is health?." 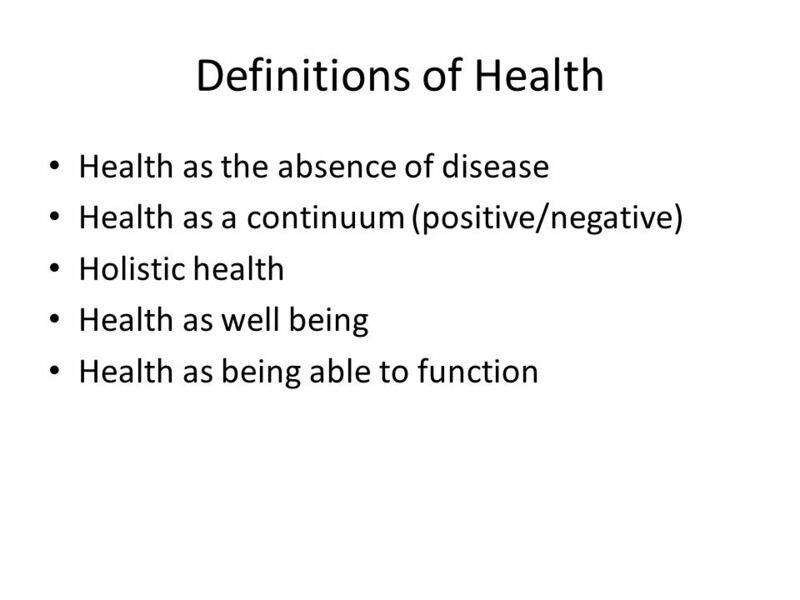 WHAT IS HEALTH QUICK WRITE: What do you think of when you hear the word health. What did you do this summer that may have improved your overall health? Gender and Politics lecture 5. are there gendered interests that require political representation? explore two main strands: - whether certain identities. 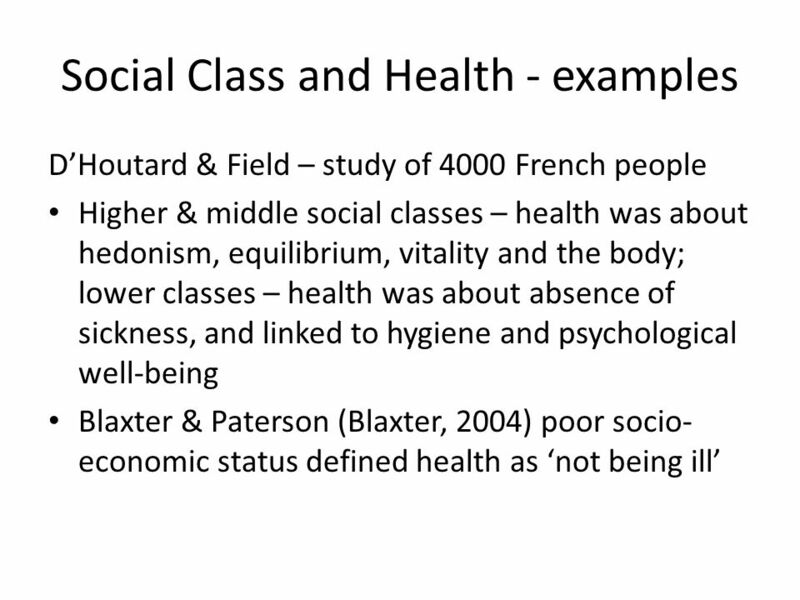 Sociology of Health and Illness Week 1. 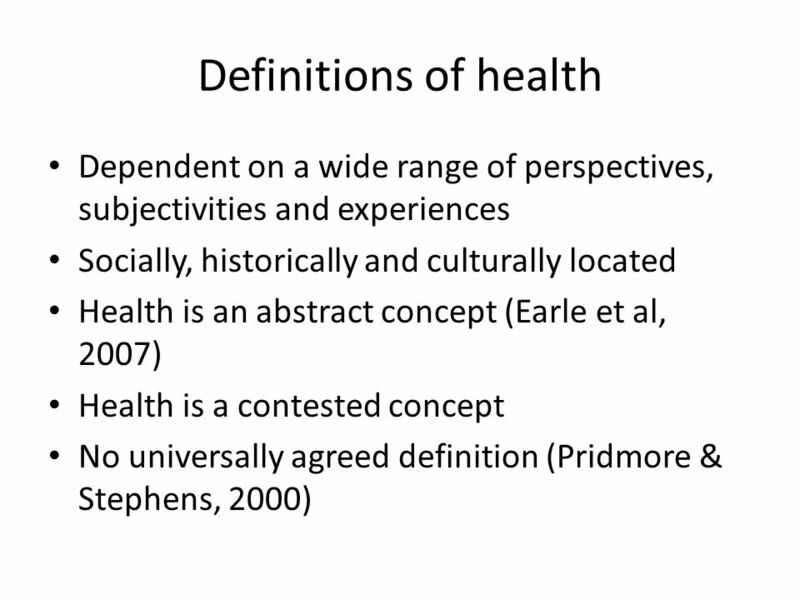 Conceptualising and Defining Health and Illness. Kasper A. Kristensen Research Centre for Health Promotion Assistant Professor, PhD Roskilde University Health Promotion and the Personal Conduct. Developing the Evidence Base for Community-Governed Health Promotion and Prevention 21st ANZAM Conference 2007 managing our intellectual and social capital. Health Behaviour in School-aged Children A World Health Organisation Collaborative Cross-national study. Understanding relationships between education, health and well-being among young people: what can the HBSC study contribute? Professor Candace Currie HBSC. Chapter 14: Health and Medicine. Figure 14.1 Health Expenditure as Percentage of GDP, 2007. 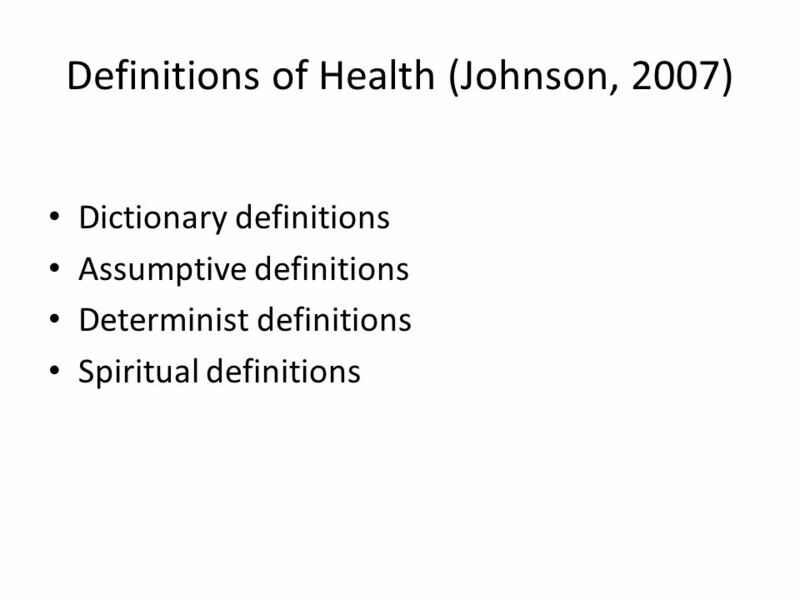 Defining Health Definitions Health can be defined, positively, negatively or holistically. This presentation examines the advantages. 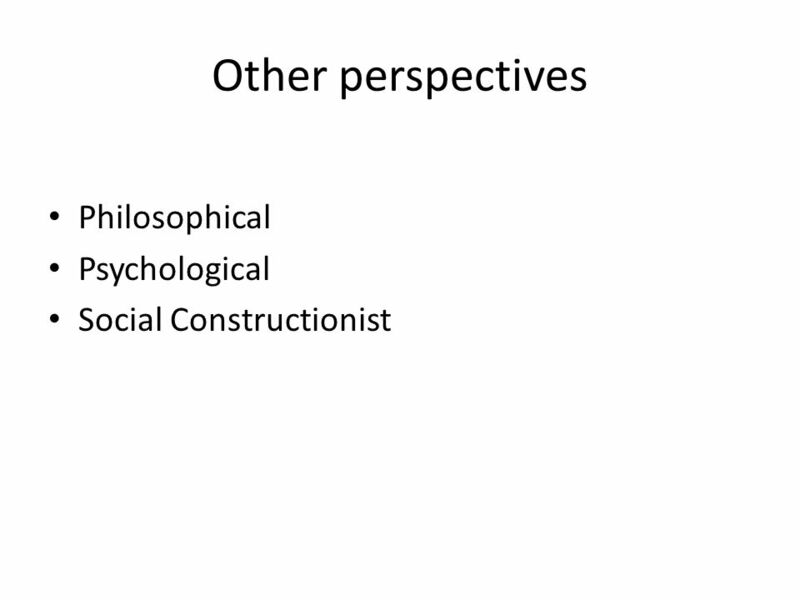 Critiques against Traditional Psychology. Group Presenters OriginAlison Crosbie Instrument of OppressionLynne Brand Psychology as a Science Sonya Hunt. 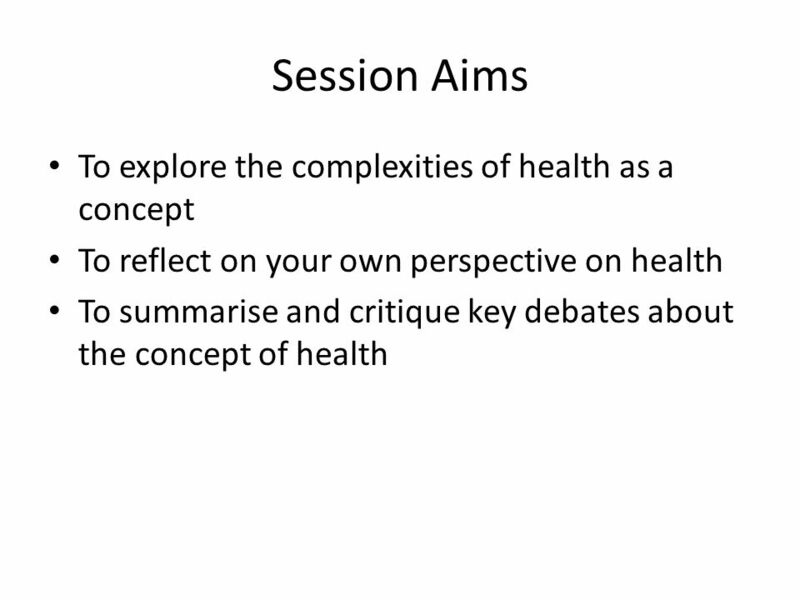 The Sociology of Health Access to health professions Lecturer: Elspeth Cordell.